While selling your home during the holidays can be stressful, the good news is that anyone shopping for a home at this time is most likely determined to buy one before the new year, and a properly staged home is sure to catch their eye! 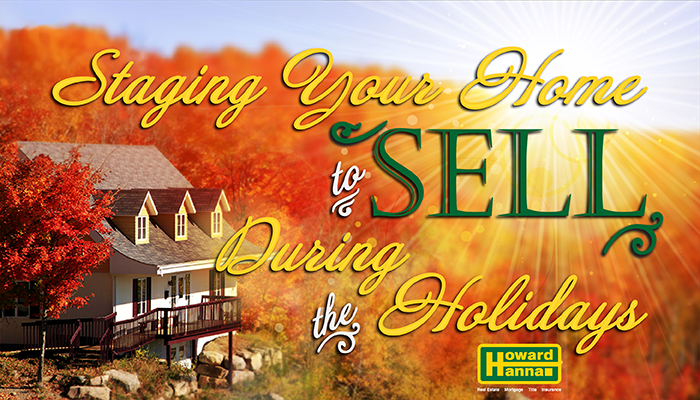 Holidays are seen as a relaxing time to reunite with loved ones; make this holiday season relaxing and successful by incorporating some of the following tips on how to stage your home to sell during the holidays. As we mentioned in our Selling with Success: How to Stage Your Home Effectively blog, the first step to staging a home is cleaning and decluttering each room. Clear all surfaces (counters, tabletops, coffee tables, desks, floors) of random knickknacks, garbage, clutter, clothing, food, toys, and other items. Clean up food remains (dirty plates, cups, food wrappers, etc.). Put dirty clothes in the hamper and clean clothes away in the closet or dresser. Vacuum, dust, and wipe surfaces down with a cleaning cloth. When possible, pack clutter up and store it away – you’ll be moving soon anyway! Before determining how best to stage your home while still being able to celebrate the holidays, figure out which room in your home is the most used one. Does everyone gather in the living room, great room, or game room to open gifts? Is the breakfast room or the formal dining room used to eat holiday meals? Many stagers recommend minimizing religious decorations used during the holidays (e.g. Christmas tree, Hanukkah menorah, etc.) in order to avoid offending potential buyers, but anyone shopping during the holidays will most likely understand that this is a festive time of year celebrated by a variety of religions. If you want to hide your religious decorations, centralizing them in a single room and close to a closet will make stashing them before showings easier. It may be ideal to use a smaller tree that’s easy to move, minimizing the number of ornaments, to avoid breaking precious objects (since the tree will move so much and likely bump into at least one doorframe). Now that your home is clean and you have a roadmap for how and where you’ll be celebrating the holidays, it’s time to decorate! Keep It Simple. The golden rule of thumb is to keep decorative objects in small groups of three to five items, as any more will make the area (fireplace mantle or hearth, tabletop, counters, shelves, etc.) appear cluttered and chaotic. Rearrange or remove some furniture. You’ll need more space for certain holiday decorations, so removing furniture may help. Depending on the shape and size of the room, it may also be more affective to rearrange the furniture in a way that complements the shape of the room. Keep in mind that sparsely furnished rooms appear larger. Enhance the existing décor. Before going all out with a holiday palette and ornaments, take a look at how the room is currently decorated. Will the holiday décor clash with the existing color scheme? Adjust your holiday decorations as needed so that they complement your current furniture. It’s more expensive to buy a green couch than it is to buy a white Christmas tree. Focus on your home’s best features. Are your arches hand-crafted with intricate moldings or do they form medieval-style points? Hang a mistletoe in the archway to help bring a buyer’s attention to this unique feature. Does your dining room have an expansive bay window? Place your menorah there to emphasize that detail. But remember to keep it simple: the focus should be on the features of the home, not on your holiday ornaments. Use scents sparingly. A common myth is that the scent of freshly baked cookies sells homes, when in reality deducing what created that complex chocolate and vanilla smell often distracts buyers from taking in the rest of the home. As with decorations, keep the scent of your home simple. According to Homes&Land, single-notes of pine, cinnamon, vanilla, or cedar help to sell your home. Welcome guests at the curb. Apply all of the above tips to the outside of your home as well, keeping the decorations simple while focusing on the best exterior features, like your expansive porch, your delightful trees, your neatly trimmed shrubs, etc. Lastly, take seasonal pictures! Since trees go dormant and drop all their leaves during the winter in temperate regions, it’s helpful to have both a picture of the house in the winter, showcasing how the property becomes a winter wonderland, and a picture of the house in the summer, displaying the home’s vibrant landscaping. For photography tips, check out our blog on how to take stunning pictures that will sell your home!